Enjoy a 5 minute ferry ride across beautiful Shoalwater Bay to visit Penguin Island. Enjoy swimming, snorkeling, explore the nature trails of just relax and enjoy this beautiful nature reserve. A short 5 minute ferry ride across beautiful Shoalwater Bay is all it takes to meet the world’s smallest penguins! 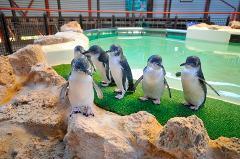 Includes entry for the penguin feeding at the Discovery Centre. 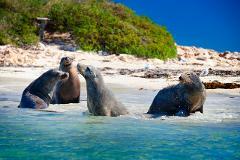 Please select a ferry departure time that is BEFORE your cruise leaving from Penguin Island. Date and passenger selection is required again. Further details are on the next page. De-stress and find your Zen! Now in its 5th year, Island Yoga takes place under the trees of Penguin Island overlooking the gorgeous Shoalwater Bay led by Kim from Safety Bay Yoga Centre and accompanied by acoustic guitar! 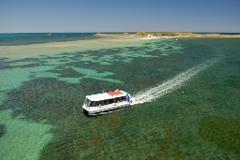 See wild dolphins, sea lions, pelicans, birds of prey and more on this 60 minute cruise through the Shoalwater Islands Marine Park before concluding on Penguin Island for a 30 minute guided walk of this stunning nature reserve.